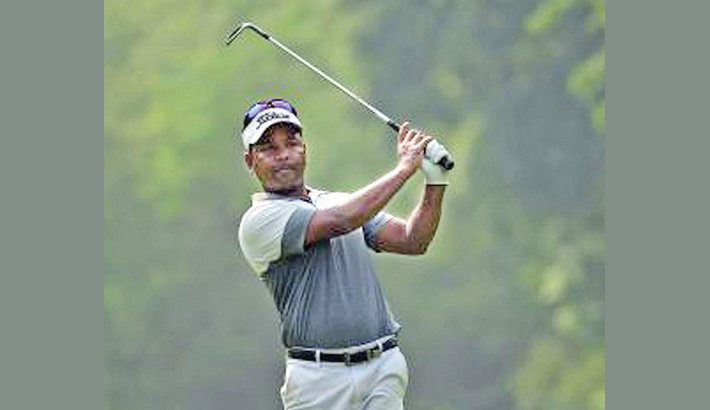 Bangladesh’s trailblazing golfer Siddikur Rahman maintained the one-shot joint lead after signing for a two-under 70 in the third round of the US$400,000 Panasonic Open India on Saturday, reports UNB. Delhi expert Siddikur aggregated 13-under 203 [67-66-70] total, a matching score with local hotshot Khalin Joshi, who grabbed the lead moving up from the joint 15th spot as carded eight-under 64 on the third day. 33-year-old Siddikur, a two-time Asian Tour winner, highlighted by four birdies in the third round against two dismal bogies at Delhi Golf Club’s par-72 course measuring 6,935 yards. It was a brilliant start for Siddikur with three successive birdies before taking one shot more than the pars to putt each in the par4 holes number four and none of the first 9. He put the 11th with another birdies to end of the day’s mission. Overnight joint leader Thai talent Suradit Yongcharoenchai slipped onto the fourth place after an even-par72 before the final day, thought maintained the lead in the first two days of the event. Siddikur needs to hold his nerve on the final day at this favourite course for his third Asian Tour title. He got Brunei Open title in 2010 for his maiden Asian Tour success before getting the Hero Indian Open 2013 at Delhi Golf Club course where he notched seven other top-10s in his career.